When you’re in the market for a new boat, by far the biggest choices you’ll come across while shopping are with bowriders. These boats have an open bow seating area and will likely be based off of a "Deep-V" hull. This will likely be the group you’ll look at first if you want a trailerable boat for basic watersports, fishing and day cruising. Most bowriders will feature an L-shaped lounge in the cockpit to encourage conversations among guests, but there are a number of different configurations available. The helm should reflect the boat’s personality and should offer clear sight lines and a comfortable, adjustable captain’s seat with a natural-feeling throttle position. Make sure the dashboard is easy to see from the seated position and that the switches are mounted where you won’t accidentally bump them. Take the time to examine the bow seating (even if you will be doing all the driving) to ensure a comfortable backrest angle and good use of space for legroom. Easy-to-reach grab rails (particularly important for those new to boating) and cup holders are a nice touch. This is one area where you can really express your own personality because you will find everything from the tamest white on white gelcoat to graphic decals that convey a wilder sense of adventure. Colored hulls are beautiful from the water, providing a more aggressive-looking profile. Upholstery and deck coverings can also provide stylish accents. Snap-in carpets provide a nice compromise between easy to clean and easy on the feet. In the world of boating, you’ll hear the term "fit and finish" often. This refers to the quality of the build, especially in places you might not see, and it will have a big impact on your satisfaction down the road. Open hatches, inspect hardware, remove cushions, and look "under the hood" to see the boat builder’s attention to detail. Well-constructed boats hold their value longer if properly maintained. Make sure to check for plenty of storage as well. One thing to look for is whether storage compartments are well finished and hinged for easy access. By all means, ask for a test drive to make sure you’re buying a boat that meets your basic performance needs. Many times the lowest advertised price on a boat will include the smallest recommended engine package. 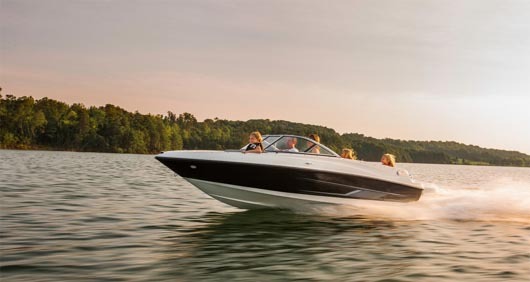 That may be fine if you and your spouse will be the only ones on the boat, but consider moving up in horsepower if you’ll be pulling tubers and waterskiers with a half-dozen people on board. No one has ever regretted having a little more punch than they thought they needed. But that doesn’t mean you have to go with the biggest engine package...look for the "sweet spot," which is almost always the middle option. When you’re behind the wheel, don’t be hesitant to open the boat up and see the approximate top speed. You won’t run at that speed very often but it’s nice to know. More importantly, see how the boat tracks (maintains its course) a comfortable cruising speed. You also want to check how the boat turns at speed.